It's good business practice for owners and managers to control what their team has access to within their Shedul account. 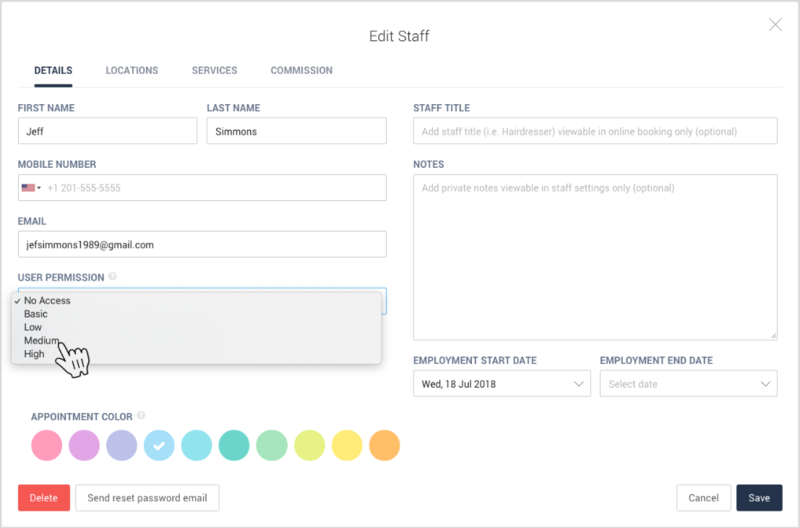 For example, service providers may only need access to their own calendars, whereas management may need access to all employee calendars and financial reports. Shedul gives account owners the ability to enable and control log-in access for all staff and administrators. If you have multiple locations on your Shedul account, you will also see permission levels as to whether you would like to grant access for a staff member to all locations, or just the location to which they're assigned. TIP: It's best practice to allow administration and reception staff access to all locations. This allows your staff to book appointments for other locations in case there is no availability at theirs, creating a smooth client experience. NOTE: Staff who have access to the Staff Members and Permission Levels tabs can grant access to other users. 3. Apply the level of access you would like to grant. 4. Click Save to apply. If you choose to give a staff member any level of access, the staff member will be sent an email to create their own password for login access. TIP: The email for staff members to set up their accounts may take a minute to arrive, and it may land in your junk mail folder. NOTE: An email address can only be used once in Shedul, so if their email is added as an admin on the account already (or with another business using Shedul) then you won't be able to give them access under that same address. Staff will either need to use a different email address or they can email us directly at info@shedul.com so we can help free up their email address. Once a staff member has been given access, you may choose to change or remove their access. For example, if a staff member no longer works with you, you may need to remove their access altogether. 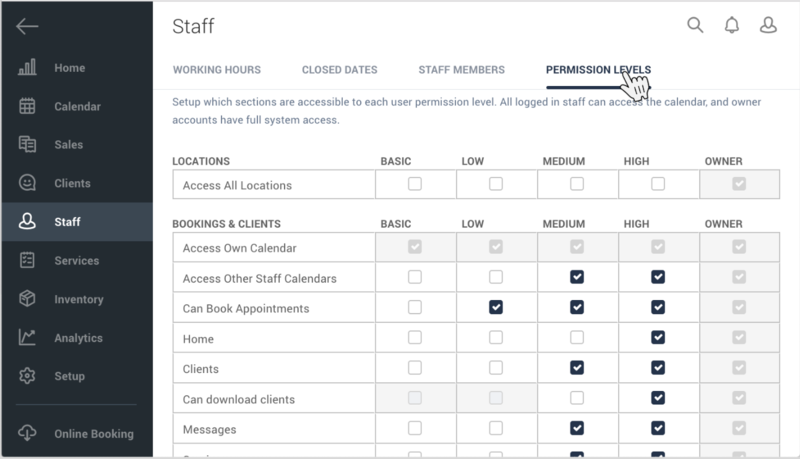 In order to change access, simply go to Staff Members, select the employee whose access level you wish to change, and adjust their User Permission level. 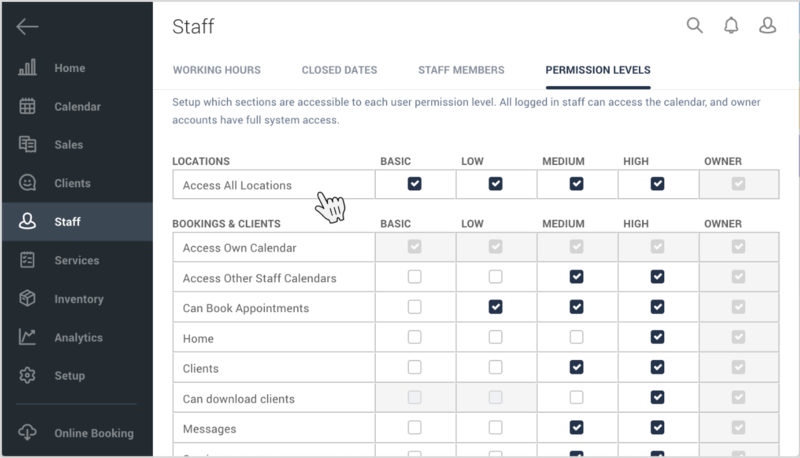 If you change their access level to No Access, the staff member will automatically be logged out, and they will no longer have access to your account. NOTE: In case you plan on deleting a staff member, we recommend you initially remove their login access to give you time to review their future appointments. We do not recommend giving a staff member or administrator access to the Setup area unless absolutely necessary, as this can include sensitive information relating to your business and Shedul account. We also strongly recommend that you do not ever share your account login details (email address, password) with other staff members. No employee at Shedul will ever ask you for your log-in information or password.